We are getting all set for Thanksgiving here and I love creating things that are perfect for holidays – or anytime you want something a little special on the table! 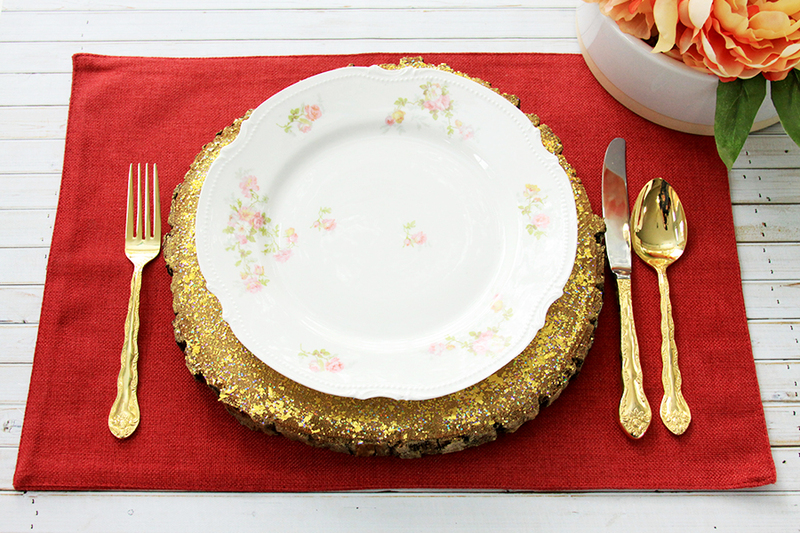 This year I’m going for a gold/pink/burgundy theme so I’ve made this DIY Glittered Wood Slice Chargers! 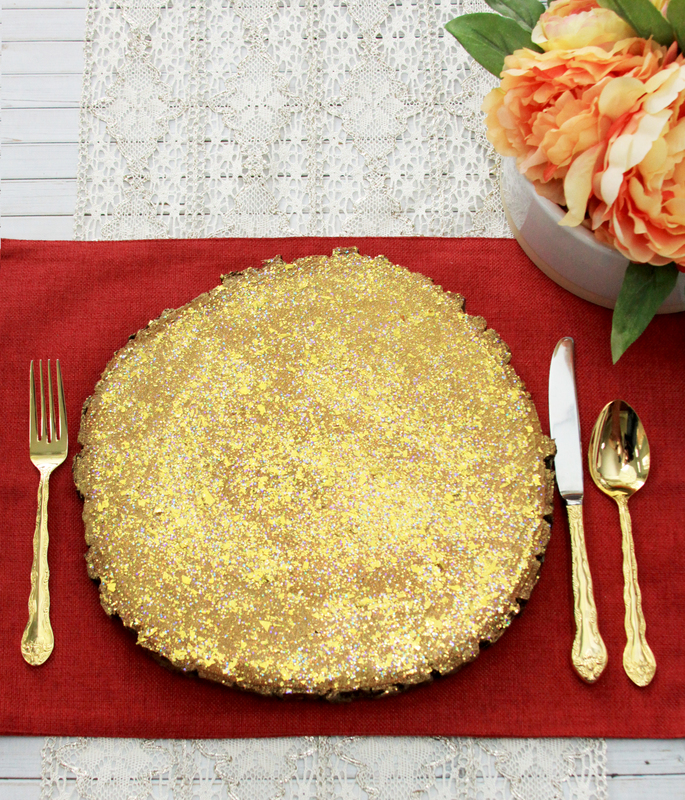 I love the shimmer of the glitter and how well they go with the gold silverware – but with the fun contrast of the rustic wood too. 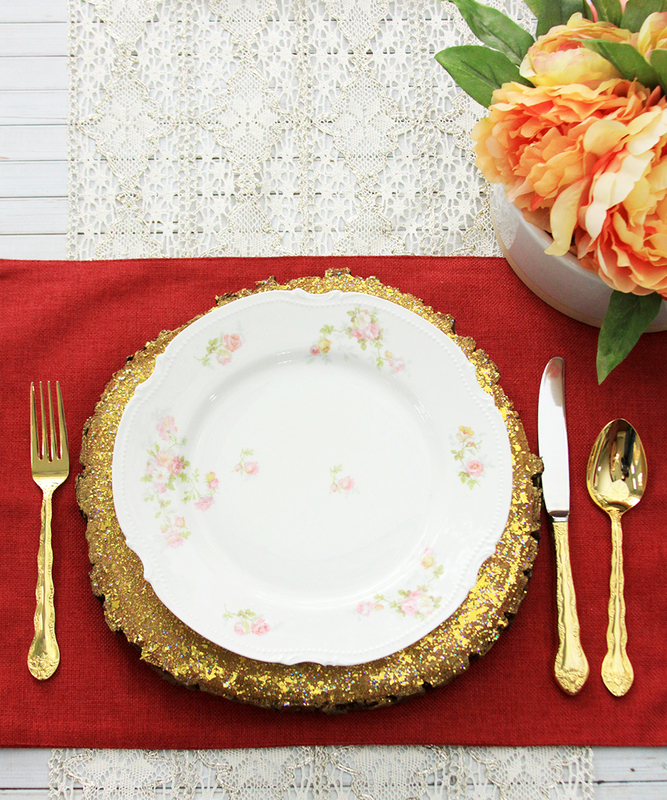 My plates are an assortment of vintage florals designs so the wood chargers really help to tie everything together. They are soooo simple to make too. It’s a little hard to show just how much they shimmer but the wow facter is really great.! 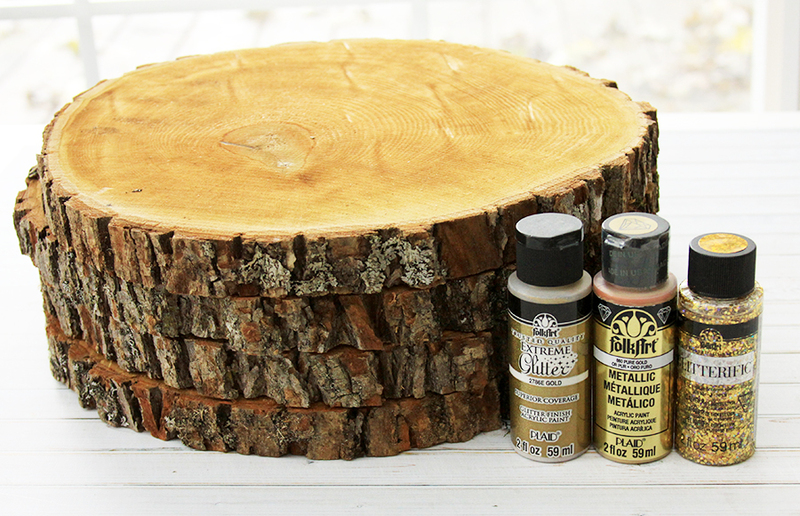 Start by covering the center of your wood slice with the Pure Gold FolkArt Metallic paint. This will even out the colorations in the wood and also give a great metallic gold base for under the glitter. 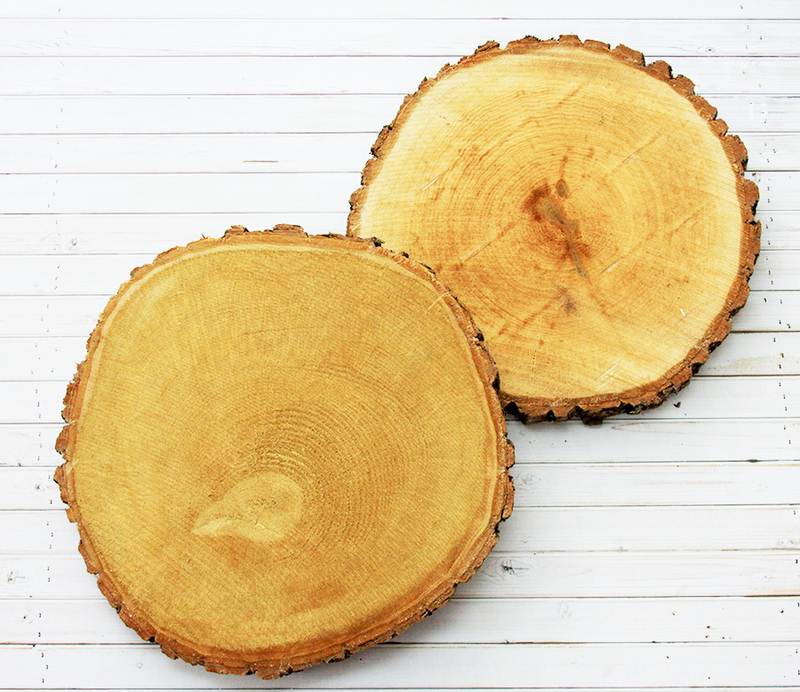 You can see in the photo below the left slice has been painted and the right wood slice is how they came in the mail. Next up is the Extreme Glitter. 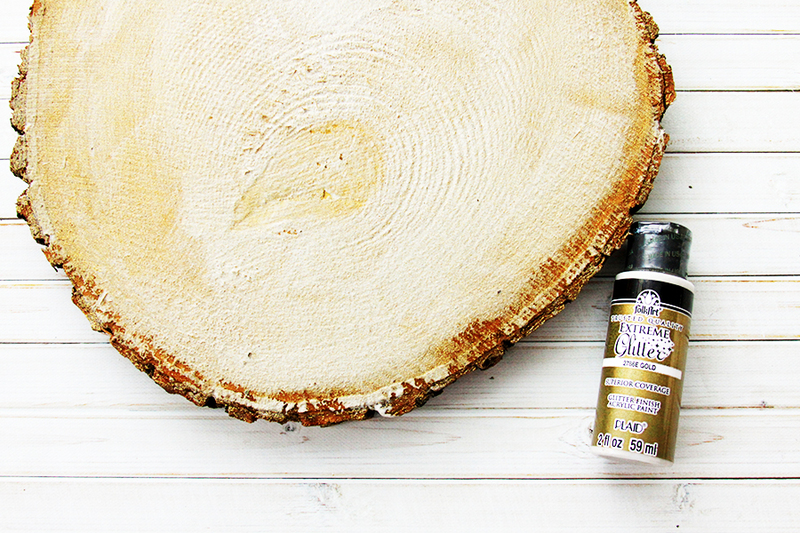 This is a very fine glitter but it gives such a gorgeous shimmer to the wood. 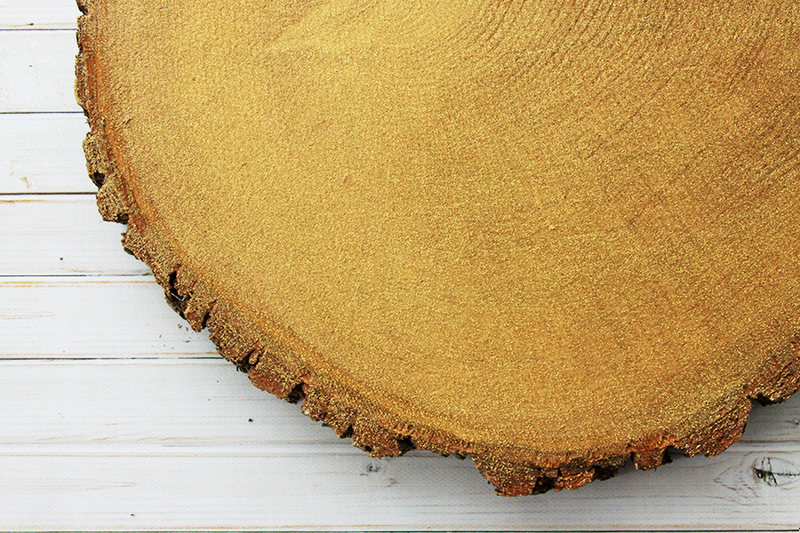 Cover the entire wood slice, all the way to the edge in the bark. The Extreme Glitter goes on cloudy but dries clear. Here’s a photo with the Extreme Glitter dried. It’s hard to see in a flat photo but in the light it is a gorgeous shimmery gold! You can see on the bark that it is a really fine glitter. 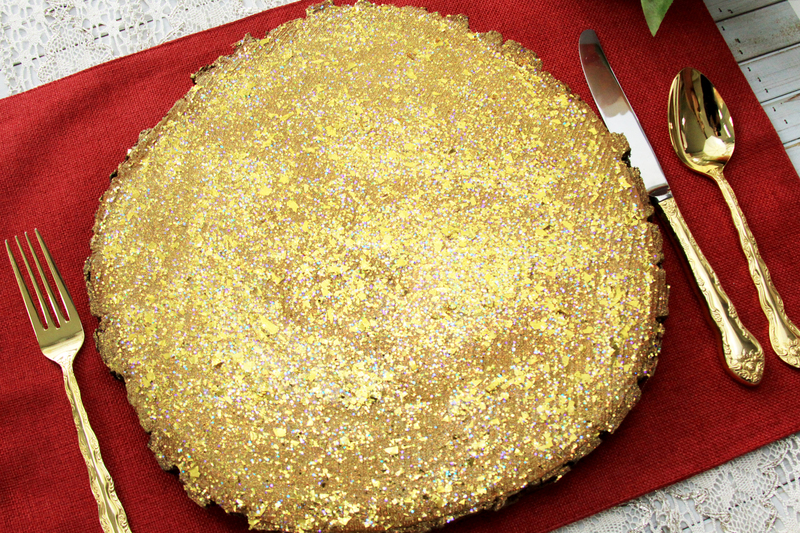 Now that we’ve added on the fine glitter, add in the Glitterific. This glitter is much larger with an assortment of flake sizes. I did one coat of each of the different glitters but if you want it even glitterier (totally a word) then you can do more coats! It’s so much easier to use than regular glitter too – there is no mess! I love all the gorgeous colors too – if you want to change things up you could do the multi-color glitterific or one of the vibrant colors. I really love how these turned out! 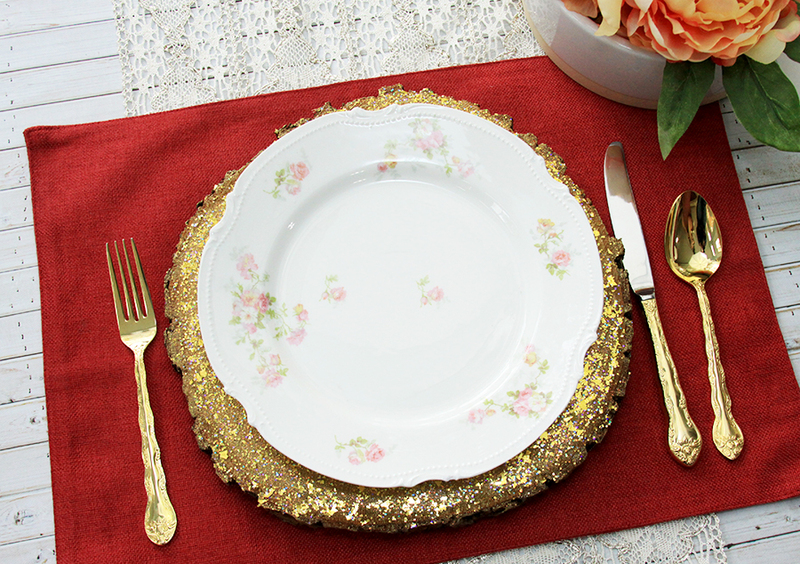 They add such a pretty sparkle to the table and since they aren’t a color, they will go with almost any place setting or holiday. If you want to do colored paint and glitter though – I think they’d be gorgeous that way too! 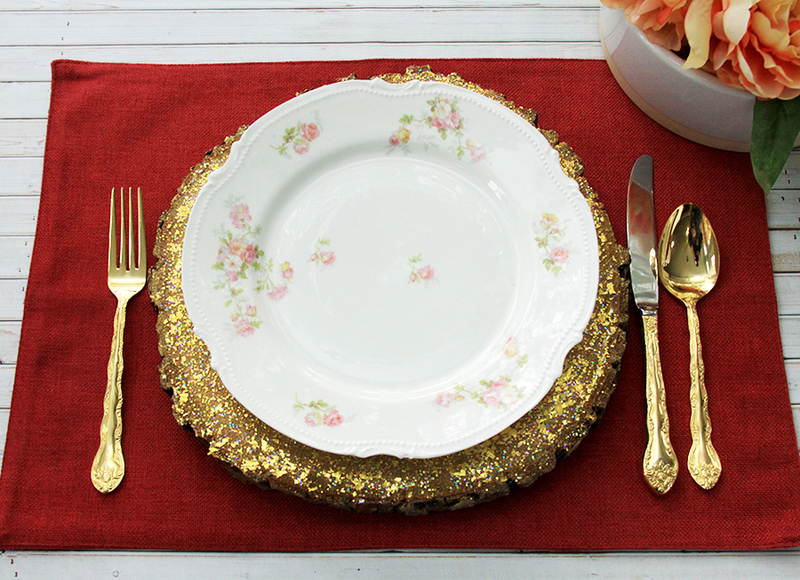 The Plaid Creators have all created different parts of a Friendsgiving or Thanksgiving tablescape! Click the links below to find everything you need for a pretty colorful tablescape – and a kids table too! We’re all posting this week – I’ll add in links as the other’s posts go live! These are freaking GORGEOUS and I want them in my house. And I want you in my house too because you are one of my favorite people on the planet. That is all.